In this feature focus we thought it would be a good idea to point out how some new functionality combined with existing data may be used to create smart solutions. Being able to publish a comprehensive and actively updated knowledge base of frequently reoccurring issues is a must for keeping ITSM staff and customers informed. The Smart Suite currently provides the option to mark specific calls as “Frequently Asked Question” and create a view to present the information to staff. The FAQ view is functional but by presenting it as a report we can improve the Knowledge Management component. In the Smart Suite 2016 release we have added Smart Reporting to create reports. When we combine the Frequently Asked Questions option that is already available we can create a comprehensive knowledge base to publish within the Smart Suite as well as host this information on inter/intra-net locations. It is possible to create an active and easy to update Frequently Asked Questions report based on existing information in the PROLIN Smart Suite and with Smart Reporting. By default, there is a checkbox on every Service Call to mark the call as “Frequently Asked Question” and assign a FAQ group. The FAQ report uses this default function to generate a Question and Answer style document. By leveraging existing FAQ strategies we can now make the information more usable for “public” use. PROLIN makes your life easy. 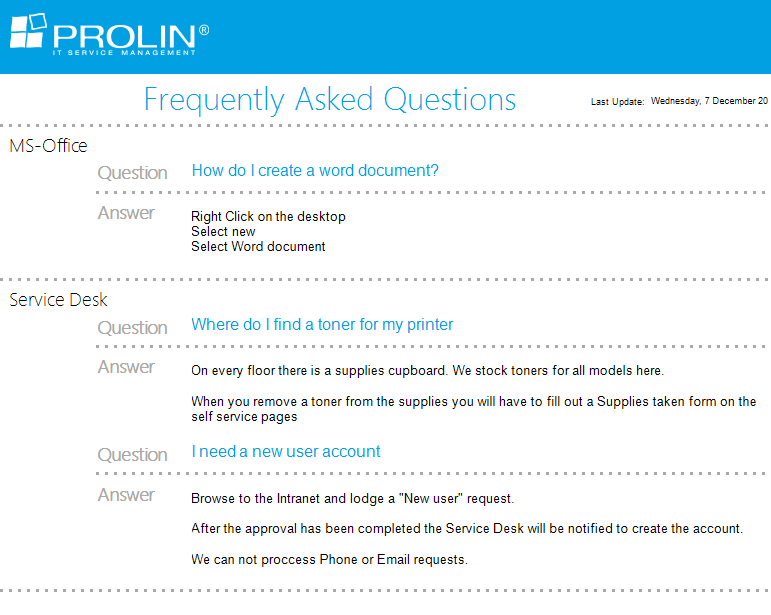 For more information please consult with your local PROLIN support representative.